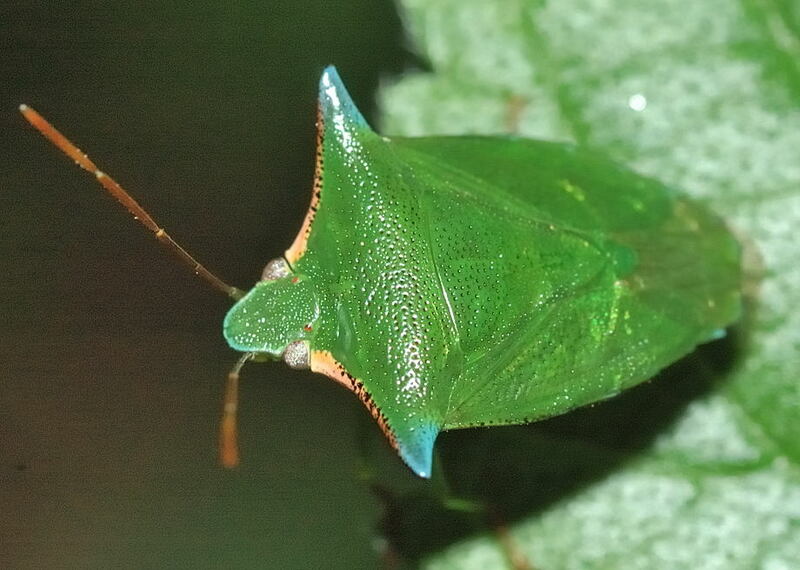 We found seven species of this Rhynchocorini tribe (or sometimes known as Rhynchocoris Group) in Brisbane. 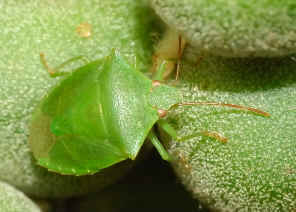 Stink bugs in this group are medium to large in size. Most of them are green in colour. Often there is spin on the shoulder. 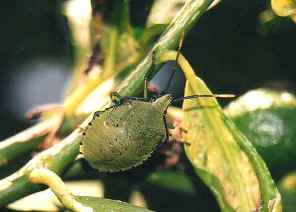 The stink bug is brown in colour with pale green thorax and head. 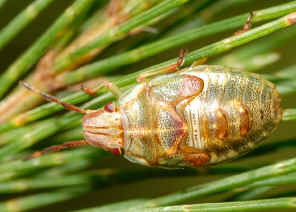 The scutellum is brown with creamy white tip. Please check this page for more information. There are 21 Australian species in this genera. Some are spined and some are not. 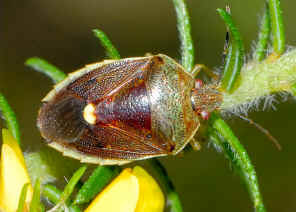 There are from small to medium in size, usually yellow, green to pale brown. 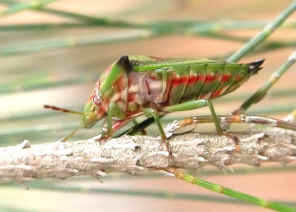 Some with dark brown bands. The head is short and wide with even punctations. 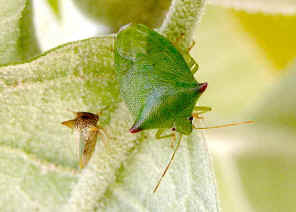 The bugs were found on the weedy plant Solanacea (nightshades). 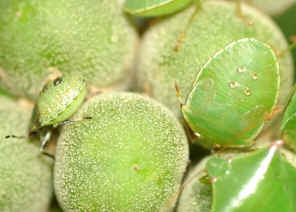 Some of them were found on Wild Tobacco Solanum mauritianum. Please check this page for more information. 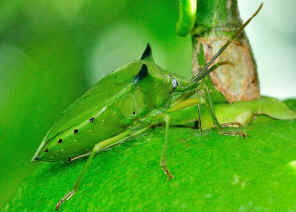 This big is green with spined shoulder. It is closely resemble the Spined Citrus Bug above but a bit smaller. 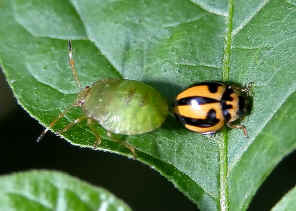 The green bug nymph was found near the Green Potato Bug adults but on the different plants. More information and pictures please click on here. 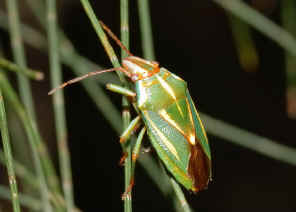 She-oak Stink Bug is bight green colour with yellow stripes on the prothorax and scutellum. 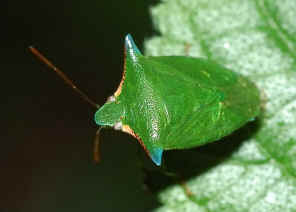 Its body is elongated oval shape with relatively large head and eyes. We have more pictures and information in this page. 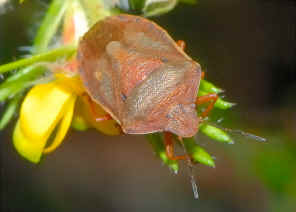 This is one of the few insects that we found in mid-winter. 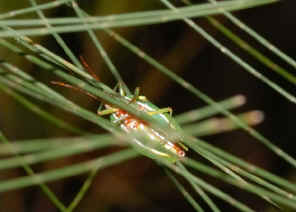 This little green bug was hiding between the pine leaves. 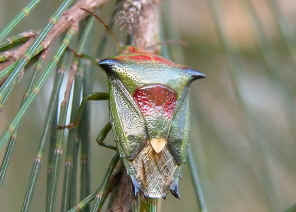 We found few of them easily on the same pine tree in Wishart bushland. 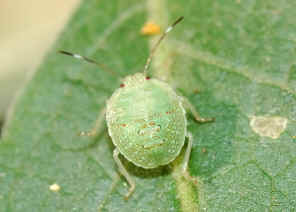 The bugs are green colour with red spots on their head and back. They have the sharp spiny shoulder. We have more information and pictures in this page. 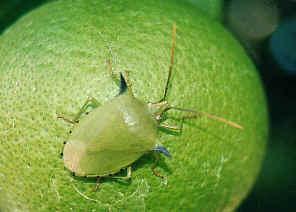 The Spined Citrus Bug feeds on the fruits of citrus trees. They make considerable damages on the fruits. 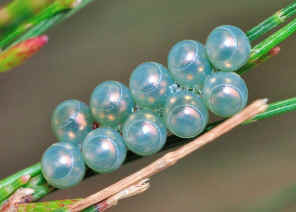 We found a few of them on the citrus trees in Brisbane Botanic Garden in summer. More pictures and information please click here. 3. Rhynchocorini - Australian Biological Resources Study, Department of the Environment and Heritage, Commonwealth of Australia 2005. 5. 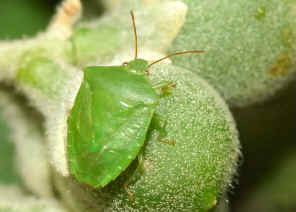 Plant-feeding and Other Bugs (Hemiptera) of South Australia. Heteroptera – Part II - by Gordon F. Gross, South Australian Government Printer, Adelaide, 1976, p453.